The "memoirs" of one of Japan's most celebrated geishas describes how, as a little girl in 1929, she is sold into slavery; her efforts to learn the arts of the geisha; the impact of World War II; and her struggle to reinvent herself to win the man she loves. 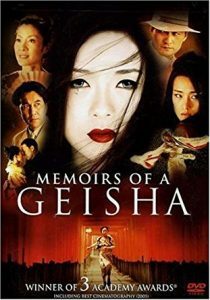 Memoirs of a Geisha is a 2005 American epic drama film. It stars Zhang Ziyi, Ken Watanabe, Gong Li, Michelle Yeoh, Youki Kudoh, Suzuka Ohgo, and Samantha Futerman. The film was released to mixed reviews from western critics, but was a box office hit and was nominated for and won numerous awards, including nominations for six Academy Awards, and eventually won three: Best Cinematography, Best Art Direction, and Best Costume Design. The acting, visuals, sets, costumes, and John Williams' musical score were praised, but the film was criticized for casting Chinese actresses as Japanese women and for its style over substance approach. The Japanese release of the film was titled Sayuri, the titular character's geisha name. If you like Memoirs of a Geisha by Arthur Golden, you may like these other historical fiction titles featuring women and that take place in Asia. It is 1959 when Haruko, a young woman of good family, marries the Crown Prince of Japan, the heir to the Chrysanthemum Throne. Met with cruelty and suspicion by the Empress and her minions, Haruko is controlled at every turn. Determined not to be crushed by the imperial bureaucrats, she perseveres. Here is the story of Etsuko, a Japanese woman now living alone in England, dwelling on the recent suicide of her daughter. In a novel where past and present confuse, she relives scenes of Japan's devastation in the wake of World War II. Following the death of their matriarch, the lives of Chye Hoon’s family are turned upside down. Amid the turmoil, Chye Hoon’s daughter-in-law, Mei Foong, must fend for her family as her husband, Weng Yu, becomes increasingly embittered. Challenged in ways she could never have imagined and forced into hiding, Mei Foong finds a deep reservoir of resilience she did not know she had and soon draws the attention of another man. Is Mei Foong’s resolve enough to save herself, her marriage, and her family? Malaya, 1941. Connie Thornton plays her role as a dutiful wife and mother without complaint. She is among the fortunate after all-the British rubber plantation owners reaping the benefits of the colonial life. But Connie feels as though she is oppressed, crippled by boredom, sweltering heat, a loveless marriage. . . Then, in December, the Japanese invade. View more suggestions for Memoirs of a Geisha.